-- Select a Size/Color -- X Small Small - Out of Stock! Medium - Out of Stock! Large - Out of Stock! X Large - Out of Stock! 2X Large - Out of Stock! 3X Large - Out of Stock! 4X Large 5X Large - Out of Stock! 6X Large - Out of Stock! Our Plain Dog Shirt in Black will have your dog looking fabulous in this versatile shirt. Stand out among all the other dogs! 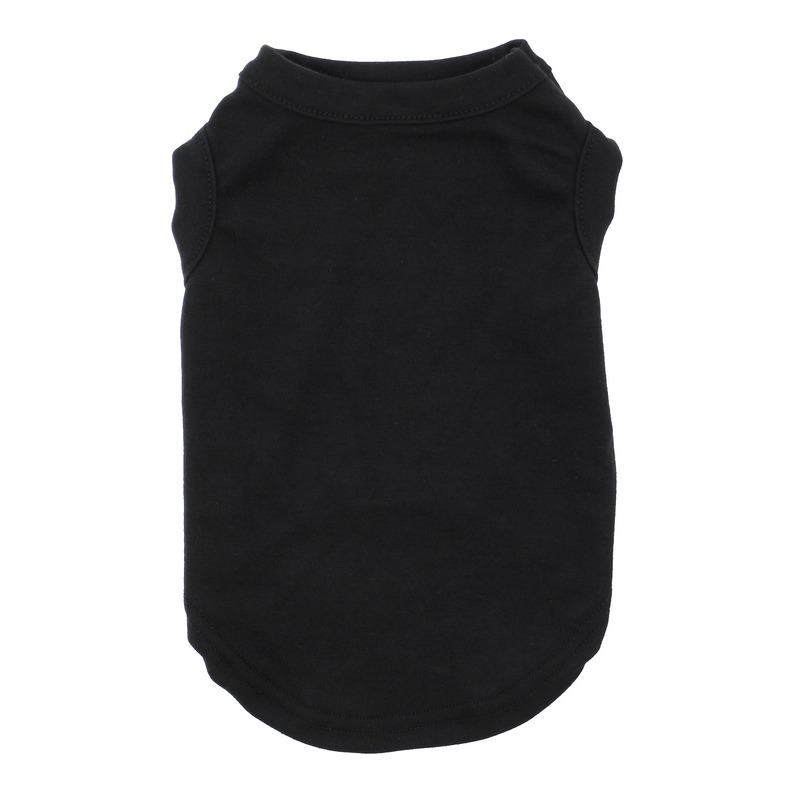 The Plain Dog Shirt in Black is a cool, comfy design for a perfect look year-round. Plus, the classic black makes quite a fashion statement! 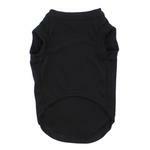 This black dog shirt is appropriate anytime, and it makes your dog look sleek and trim. For even more fun, add iron-on patches, embroidery, or screen printing to commemorate an event or just for cuteness. Plain Dog Shirt - Black Customer Photos - Send us your photo! Bourbon and Whiskey are my two sweet little Yorkie boys! They like wearing their BaxterBoo shirts all day long because they feel so soft! This photo contains the sisters Izabella (black), Cinderella (green), Esmeralda (red). They love their basic t-shirts and the shirts keep them warm when their long hair gets cut. Lincoln, our 9 Month old Pug-Shih-Tzu, is a hansome puppy in his black shirt and bow tie. Walter, our 9 month old pug-shih-Tzu, is a hansome puppy in his formal tie and black shirt. finally a T shirt that fits a little long dog! Posted On 11/12/17 by Karen V from University Park, MD Yes, Karen V recommends this product! This is a great shirt, easy to get in and out of, and the sizing is terrific. This shirt fits my pug perfectly and the black goes with any of his different color harnesses. Posted On 02/14/17 by Randi P from Elkins Park, PA Yes, Randi P recommends this product! Posted On 11/21/16 by Samantha from , CA Yes, Samantha recommends this product! I bought these for our pug. They work perfect for her, plus I can use my silhouette and heat transfer vinyl to make them personalized for half the cost of regular dog tshirts. I ordered and XL thinking the sizes would be normal fitting but to my surprise it was WAY to small. Seemed more like a medium to me. I had a good size order and a few items that I did get were perfect, such as th3 bandanas, and the bow tie, but both of the shirts I ordered I will be returning. Posted On 09/17/16 by Jessica C from Caguas, Yes, Jessica C recommends this product! It fit perfectly for my Basset Hound! Posted On 12/24/15 by Kimberly P from Newark, CA Yes, Kimberly P recommends this product! Posted On 01/02/15 by Kimberly P from Newark, CA Yes, Kimberly P recommends this product! My bulldog looks good in this plain black shirt. Its plain but cute. Posted On 12/09/14 by Eduardo Z from Arleta , CA Yes, Eduardo Z recommends this product! I love how my puppy looks in his shirt. He loves it to. He looks really cute with his shirt on.